Very Good. 185723720X ALL BOOKS SHIPPED WITHIN 1 DAY OF PURCHASE! Ender's Game is the best sort of science fiction: The author uses imagination to build on the reality of his time, obeys basic physics, doesn't use "gizmos" to get himself out of corners arising from poor plots. Start your reading of the Ender Saga here, if it is not too late. Subsequent stories... and there is a rich vein to mine... all build on the events in Ender's Game. Started as a short story in 1976, expanded into a novel in '85 it uses a recognizable internet, tablet computers (a la iPad/ Andriod), Wi-fi, "Twitter"/"Facebook" for empowering democracy. Amazing. His books also delve deeply, and to my understanding of the topic, into "how people work". This is among the best sci-fi novels ever written. Not as good as Clarke's "Childhood's End", but then no novel has surpassed it. There is an OMG about seven-eighths through that is ingenious. Then read "Speaker of the Dead". The remaining 'Enders' books are not worth bothering about. Considering I've been a lifelong reader of sci-fi, it is somewhat surprising that I've only just read this classic for the first time. I was slightly concerned when picking it up that everyone who seems to love it was introduced to it as a kid, and sometimes with certain books, the magic just isn't there for adults. Luckily for me, 'Ender's Game' is very good on its own merits. It tells the story of Ender Wiggin, a young boy who is taken from his family to attend battle school in the hopes that he might save humanity from an old enemy. Orson Scott Card is surprisingly deft here when dealing with the war on the "buggers." This war seems to be interminable, and no one is entirely sure the enemy is even still a threat. Meanwhile, Ender is being transformed into a war machine. Or so they think. The greatest conflict of the novel is not Ender's development of military skills, but his fight to remain himself, and to keep hold of his compassion, morality, and everything else that makes him human. 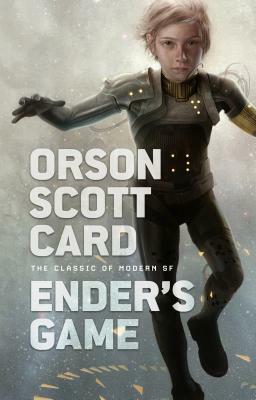 I found "Ender's Game" to be a gripping read, and despite the strangeness of reading about child soldiers (of course they do exist in our time, but in more horrific circumstances), the novel does a pretty good job of portraying the kids realistically as they fight to ascend the ranks of the military. I'm very glad to have finally read this book, and I'm especially relieved that you don't have to be a young adult to appreciate it's worth. excellent service and book just as promised,thanks! Teacher gives it two thumbs up! I was introduced to Ender's Game by my husband, long-time a science fiction/fantasy fan. I fell absolutely in love with the book the first time through and have read it (or listened to it) at least 4 more times; I enjoy it more with each read. It is a Children's story, and very Boy Oriented, which makes it wonderful for my use in my special education junior high school English class. My students are enthralled from the first and maintain a high interest throughout our study of the book. The game aspect, the ?war? orientation, the idea of living away from home, the bullying, the fights, all make this a highly appealing book to many adolescents. However, there is much more going on in the book, and it opens up areas for discussion such as: the morality of preventive war, the destruction of a species, communication, government controls, zero population growth, relationships between a leader and the troops. The list could go on and on. The books that follow in this series are very different in setting, tone, themes. In most, Ender is an adult with adult interactions, perceptions, concerns. I have enjoyed them all, but especially this book and Ender's Shadow, which covers the same time period from Bean's perspective. If you are looking for a high action, fast read, this is the one for you! Enjoy!